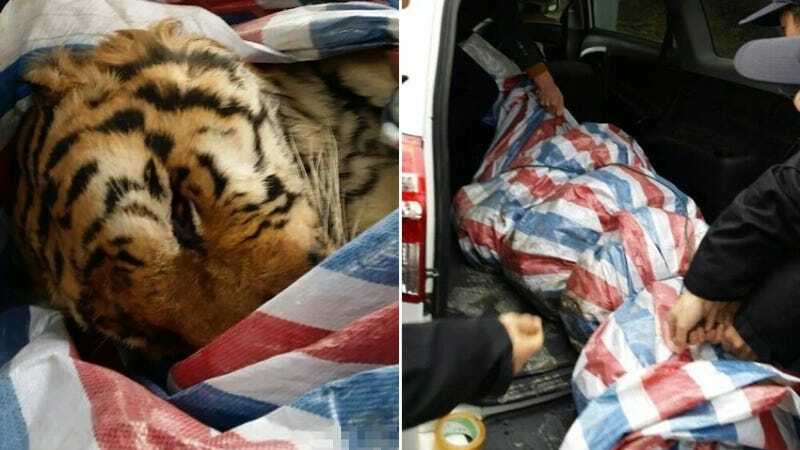 China Car Times has learned Chinese police found a dead Siberian tiger under a damn tarp in the back of a RAV4 during a traffic stop. The Toyota was pulled over in Wenzhou, about 300 miles south of Shanghai. Apparently two people were in the vehicle when police showed lights, but one of them sprinted into the sea of anonymity and has yet to be tracked down. Wenzhou is nowhere near where tigers roam, in the north east of the country near North Korea. Only the 2.0 and 2.4 RAV4 were sold in China, so that pokey little cute ute would have been working pretty hard to haul an 800 pound animal halfway down the country. China Car Times suggested that the tiger was slated to be chopped up into medicine. I suspect bachelor party antics, though no word on whether or not Mike Tyson has a place near Wenzhou. Messing with tigers is serious business in China. I mean, they're massive carnivorous beasts so you'd be best served leaving them alone anywhere. But even if you survive an encounter with the animal you could still be executed by the state for possessing one, live or dead.